Still on the lookout for predominantly white sneakers to showcase this Summer? 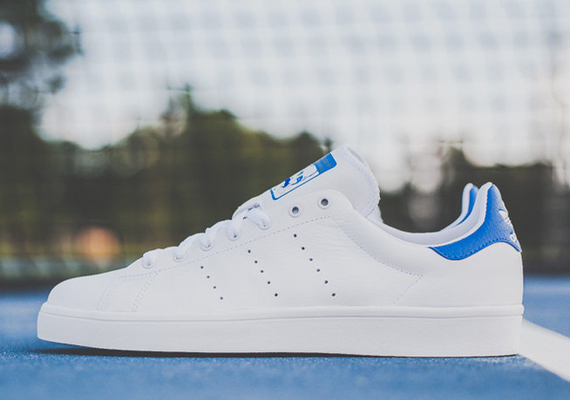 While this latest adidas Stan Smith Vulc isn’t quite all-white, the vulcanized sole wielding pair should do the trick because everyone’s wardrobe deserves to have at least one of these adidas Originals classic releases in it. The pair sports a premium white leather base as the three stripes are designated through the usual perforations on the side panel and the tongue branding and back heel light up in a royal blue. Although the Stan Smith has kept busy this Summer, this is the first time we’re seeing the vulcanized sole edition hit retailers, so stick with us after the click for a better view and pick up your pair today at select retailers like Politics.